Weather is wild and unpredictable, even by those to proclaim to know. It is frustrating, always has lousy timing and is completely out of our control. And it’s also beautiful and powerful and is the source of endless inspiration for many artists. 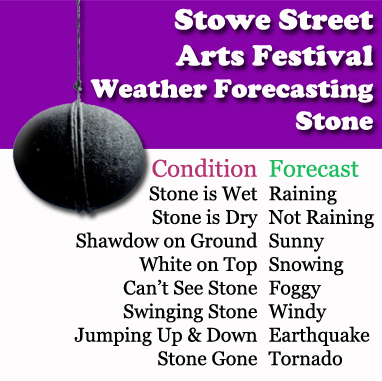 But whether or not the weather cooperates with the Stowe Street Arts Fest, the show WILL go on! So far it seems hardly worth mentioning that the rain location for LIVE from Stowe Street is at the Thatcher Brook Primary School, or that Saturday’s event will go on as scheduled even if the Sun is a no-show. But if you really what to get a good sense of what the weather looks like, check out the SSAF’s hand Weather Forecasting Stone, below.